Energy deals between Russian oil major Rosneft and Chinese partners will be worth more than $500 billion in the next 20 years, according to Rosneft CEO Igor Sechin. "Taking into account mutual trade and the existing contracts, the total value of cooperation of our company [with Chinese partners – Ed.] through 2035 will amount to $500 billion at current prices," Sechin said during the Eastern Economic Forum on Friday. Moscow and Beijing are negotiating an increase in Russian oil supplies to China, said the chairman of the China National Petroleum Corporation (CNPC) Wang Yilin. "China currently imports 15 million tons of crude oil from Russia through a pipeline. Now we are working on building a separate pipeline to increase the supply of crude oil to China,” said Yilin. He added that the two companies are cooperating and expressed hopes that the goal of increasing crude oil supplies to China will be reached as soon as possible. Russia became Beijing’s top crude supplier after China imported a record 3.92 million metric tons from Russia in May, which is equivalent to 927,000 barrels per day. Russia overtook Saudi Arabia as the biggest crude supplier to China. 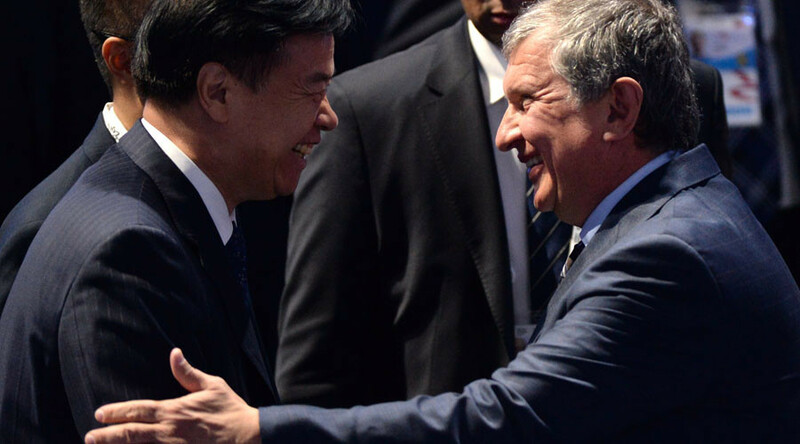 Rosneft and CNPC signed a 25-year oil deal worth $270 billion at the St. Petersburg International Economic Forum two years ago. According to the agreement, the Russian company is expected to supply 360.3 million tons of crude to China. On Thursday, during President Putin’s visit to China, Rosneft inked agreements with China worth a potential $30 billion.